Thompson, Winston Participate in Intensive Music Theater Program in Germany | The Gettysburgian. Abigail Winston ’19 and Aaron Thompson ’19 studied musical theater in Germany this past summer (Photo courtesy of Thompson and Winston). 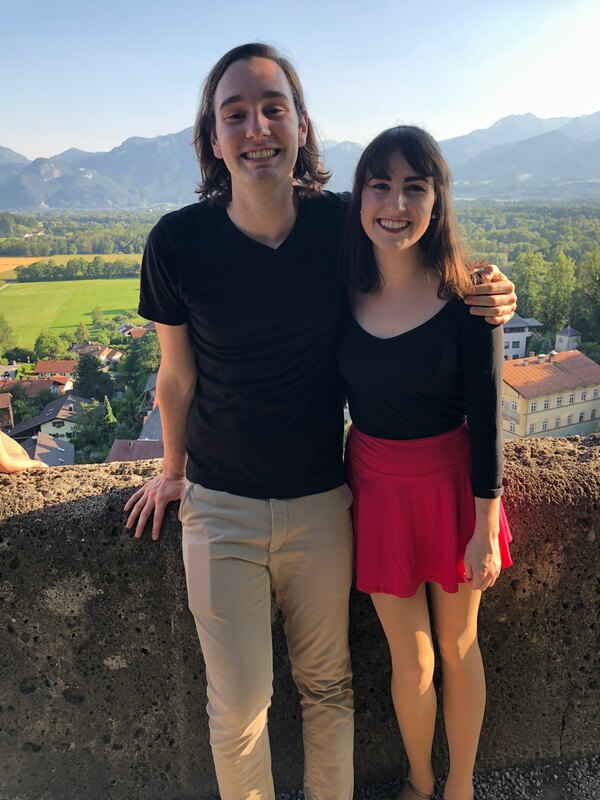 This past summer, Aaron Thompson ’19 and Abigail Winston ’19 took their talents overseas and participated in an intensive, four-week long musical theater program in Oberaudorf, Germany. In late June, Thompson and Winston set off on an “eye-opening” journey, as Winston described it, both returning a month later “hugely reassured” of their passion for the craft. The program, Musik Theater Bavaria, hosted students from multiple countries and backgrounds, who were all joined by their love and passion for the arts. The program, comprised of 32 students total, included 8 students who were there specifically to study musical theater, Thompson and Winston included. Their days, which began early in the morning and ended late in the evening, provided them with valuable information, not just about technique, but taught them “how to make actual connections in the business,” Thompson said. Both Winston and Thompson agreed that having the opportunity to spend their time studying musical theater specifically and in such an in-depth manner was incredible, especially given the lack of opportunity for intensive musical theater study on campus. “I felt hugely reassured because I have so many things I would like to do, and this experience made me realize that I could actually do it,” Winston said. Her sentiments were echoed by Thompson, who also expressed that the program pushed his German-language skills, having previously taken courses in the language. Though their hectic class schedules kept them both from international travel while there, they were both able to explore Germany. They both expressed that one of the things they appreciated most was getting familiar with the town they lived in and becoming more comfortable with their home away from home. When asked if they would recommend programs like this to other students in the future, Winston and Thompson both responded with a resounding, “Yes!” They also expressed that the program furthered their appreciation for musical theater and reaffirmed their enthusiasm for a future in that field. Such an amazingly talented duo! Watching Abby and Aaron perform, you forget they are college students and not professional performers! I’m so happy to see them taking advantage of these rare and precious opportunities. Best wishes for you both! !